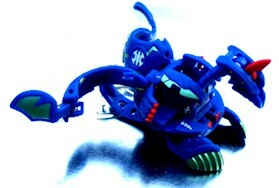 Viper Helios is an evil dragon that enjoys sending Bakugan to battle and obeys every command from the heinous Spectra. He has thorns tipped with poison covering his entire body and mammoth wings that allow him to move swiftly and avoid quick attacks from opponents. To destroy his enemies, he can shoot cannonball fire blasts with rapid speed from his mouth. Purchase Viper Helios from Amazon now!